Flexfins are designed to increase leg strength and foot flexibility. Color coordinated by size for easy identification. Flexfins are a perfect choice for swimmers at any level that are looking to increase performance and decrease times. 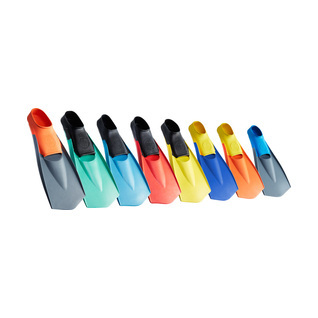 Tyr FlexFins are color-coded as below. All fins are in male sizes, for female equivalent, size down 1-2 sizes. I have only used these about 500 meters now. I have 11.5 feet and ordered the 11-13 size. It fits perfectly and I just hope it does not expand or the rubber stretches out. Right now it is a great snug fit and comfortable rubber. Excellent quality and does its job. Have used similar fins and expect the same quality and comfort from these.